No, winter hasn't come early. In fact it's nearly 100 degrees in Central Illinois right now. 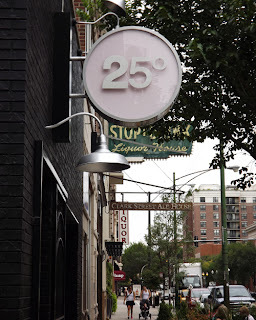 25 Degrees refers to a brand new burger lounge in downtown Chicago that's filled with mouth-watering food and plenty of wine and spirits. The Chicago restaurant was opened by Joe and Mac Boumaroun, brothers who had previously owned the Lebanese restaurant Aladdin's Eatery in Chicago. 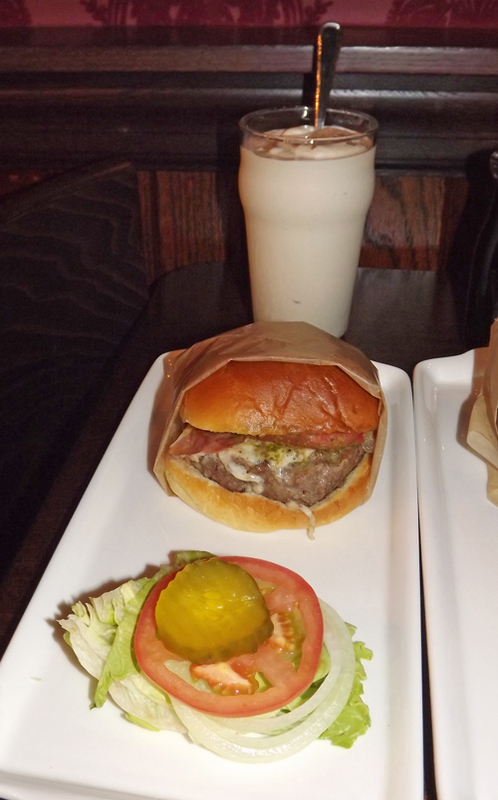 They were intrigued by the concept of an upscale burger place and this particular chain had taken off on the west coast. They are putting it all together with acclaimed chef Tim Goodell, who has added a few things to the menu (like the Potato & Three Cheese Fritters) that are unique to this location. The official opening was just last week and it looks like a place the windy city will see around for a long time. 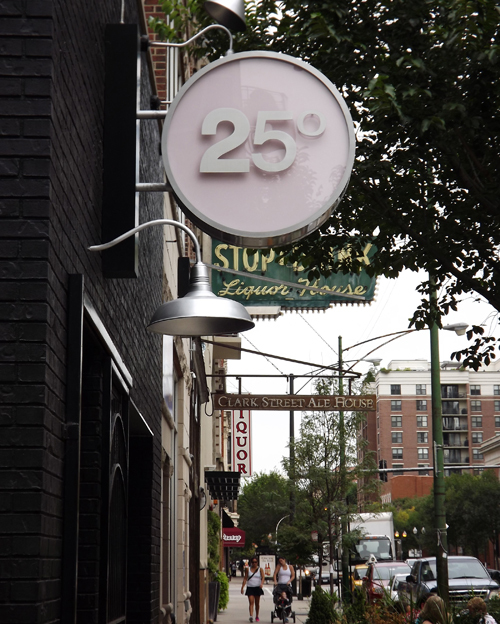 The 25 Degrees is the difference between a medium-rare burger and one that is well-done. The latter is my preference and the Wisconsin sirloin was cooked to perfection, juicy without any red. I topped it with roasted tomato, avocado and a Winelaise, an aged cheddar-blue cheese combo that completed the taste. It was a perfect choice, but the key here is that each person gets to make their own perfect choice with 15 different toppings, 15 unique cheeses and 15 different sauces. While i waited for my personally designed burger, I had an incredible salad of heirloom tomatoes, goat cheese and watermelon in Parmesan truffle oil. I also tasted some of the French fries, onion rings and sweet potato fries with three of the sauces -- Garlic Parmesan, Tarragon Remoulade and Pesto. 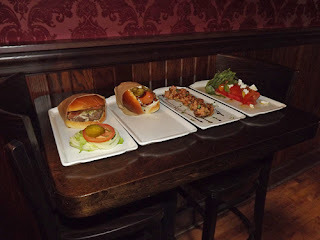 They were all tasty, but my favorite combo was the Sweet Potato Fries with the Tarragon. I couldn't even come close to finishing the monster burger (which is priced only around $10 to start) and brought it home along with the fries for two more lunches. I also took an (unspiked) Double Chocolate Milkshake for the road, which satisfied my cocoa craving for the week! If you aren't in the mood for burgers, 25 Degrees also has small plates with items like Spicy Tuna, Bacon Wrapped Figs, Hot Dogs and more. It's also worth a trip for drinks in their comfy booths. It's quite a selection, with about 20 unusual wines by the glass (or jug), hand crafted cocktails and spiked milk shakes. I had to drive over two hours home or I would have been tempted to try one, like their Guiness Shake with Vanilla Haagen Das and Chocolate Sauce. 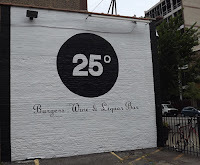 You can find 25 Degrees, which also serves brunch in front of their large TVs, at North Clark Street. visit their website or Facebook page for more information. Congrats Joe and Mac. Next time in the windy city I will definitely stop by for a burger and drink:) Your new place sounds great!! Way to go!!!! P.S. tell the family I said hello.